Airbag didn’t go off - why? So today in Moab I stood the Jeep on the front bumper. It has an LOD bumper. Was in low range when it happened. It hit hard enough to tweak the bumper. Afterwards It dawned on me the air bag did not go off (and I’m happy it didn’t). Does low range cancel the air bag sensor? Any ideas? It didn't go off because you didn't hit a sensor that would make it go off. There are sensors around the vehicle but the two you're looking for are behind the headlights. Smash your grille into a rock and you'll see them go off. Also, since you've got the conversation open, have you (and anyone else reading for that matter) checked your VIN recently on Jeep.com to ensure there are no open air bag recalls? I had mine done a few months ago on the passenger side for a 2010. If you didn't injure yourself when you hit the front bumper, then the air bag worked perfectly. The airbags are designed to protect you from injury. From my understanding air bags aren't suppose to go off if you are traveling below 15mph, thus you don't want an airbag blowing up in your face just because you happened to bump into the car stopped in front of you in a minor fender bender situation. Just out of curiosity, where did you stand it up? Who wants to lay bets before falling into that situation his words just prior were "Oh sh*t.....oh sh*t.....ahhhh....sh*********t!" Then followed by a good ole...."F*****k!" with a palm slam on the steering wheel. Holy crap! 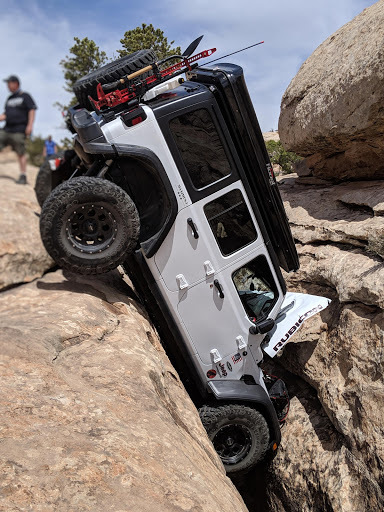 I just watched one of this guys Youtube videos yesterday about his Jeep at the EJS this week! He calls himself American Jeeper. I hope he and all involved are ok. I wonder what trail that was and what happened. It happened on Golden Spike.....and honestly, I can't for the life of me figure out where on that trail. I essentially drove that by myself this summer. I tugged along a buddy in a rented jeep that had never wheeled before, and didn't see a single sole the entire day doing the golden trio. Not to totally derail OP's thread, was just curious. Only thing I could think of is Golden Crack, but that looks way too wide, and there is not a single thing you could get high centered on around that. Well that looks like a slap and tickle party type of good time. I've totally de-railed the OP's thread. I still want to know where OP stood jeep on its nose. I don't understand how in 2019, you can have YouTuber, and bystanders, one of which may or may not have lost a leg, not have 1000 videos of this accident floating around. I drove PS, GS, and GBR this summer. IDK where on earth you get high centered to begin with, then floor it and fly off in to a crevasse, so I've just been trying to understand. ***btw, figured safe to assume this wasn't OP since 1) it's a JL, and 2) airbag clearly deployed. That guy hit one of the spectators. They had to amputate part of her leg because of it. Quick Reply: Airbag didn’t go off - why?